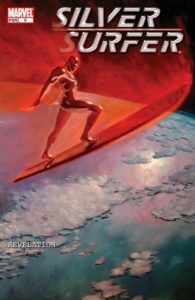 The Silver Surfer comic books definitive issue-by-issue collecting guide and trade reading order for omnibus, hardcover, and trade paperback collections. Find every issue and appearance! A part of Crushing Comics. Last updated November 2018 with titles scheduled for release through July 2019. Silver Surfer has had several ongoing titles over the years collected in a variety of formats. However, there are a few specific formats of books that cover large portions of this title, and I’ll cover those first – Essentials, Epics, Masterworks, and Omnibuses. Join the Crushing On Crushing Krisis mailing list for a notice whenever this page is updated with new collections – plus, a infrequent ping about new comics content. Essential Editions are not repeated below in their chronological placement, since B&W is not the original format of this series. Collects Silver Surfer (1982) #1, Silver Surfer (1987) #1-18 & Annual #1 and Marvel Fanfare #51. The Essentials line has been discontinued and will not extend past #18. Jump to that spot in the chronology. Marvel’s Epic Collections represent a consistent, affordable, full-color bookshelf format of issues in perfect continuity order without a single gap. The catch? 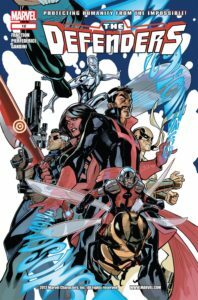 Marvel is releasing them in a random order to focus on the biggest gaps first – since early issues are already well-covered by both Essentials and Masterworks. Epic editions are also listed below in their chronological placement, as they are frequently the only coverage of a specific run. Volume 2: Not yet announced. 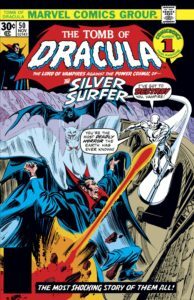 Will contain Silver Surfer (1968) #1-18, and possibly Tomb Of Dracula (1972) #50. Volume 7: Not yet announced. Unknown what this will collect; it could be that Volume 6, directly above was misprinted and should have been Volume 5. Alternately, this could collect no issues of Silver Surfer but collect The Infinity Gauntlet and some amount of its tie-ins. Marvel Masterworks editions are high quality, full color reproductions of original issues. The volumes were originally released as hardcovers, with many now out of print. Some of the earlier editions were also released in paperback. If you decide to buy hardcovers, the newest editions are from 2003 and, with silver dustjackets. Masterworks are not listed below in their chronological placement, but they are referenced if they are the only means of obtaining an issue. Jump to this spot in the chronology. These massive tomes have larger pages and collect huge swaths of comics – between 25 and 50 issues a book. They look beautiful on a book-shelf! Other omnibuses not primarily centered on this material are also listed in this guide chronologically. Omnibus editions are also listed below in their chronological placement, as they are frequently the only coverage of a specific run. Collects Silver Surfer (1968) #1-18. These flashbacks help to fill in stories of Silver Surfer from before he came to Earth in his last duty as a herald of Galactus. 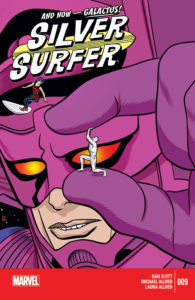 Silver Surfer debuted in Fantastic Four #48 as a herald of the oncoming Galactus. For other collection options, see Fantastic Four and Hulk (for Tales to Astonish). Also collected in Masterworks and Essentials, above. After the continuity of his title ends, the Surfer next appears in two retrospective/flashback series: Webspinners: Tales of Spider-Man (1999) #4-6 and Fantastic Four: World’s Greatest Comics Magazine (2001) #6-7 & 11-12. The section continues to treat Fantastic Four appearances as “major” appearances that are not relegated to italics as guest appearances. Sub-Mariner #34-35 & Marvel Feature #1: These are lead-in stories to the Defenders. See The Defenders for collection information – or, Sub-Mariner, for collections exclusive to Namor. Silver Surfer departs The Defenders and shifts to guest-star status. 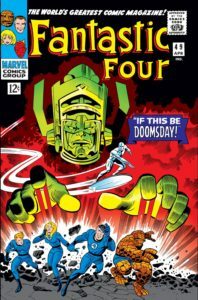 After FF #157: Code Of Honor (1997) #2 (a flashback series), Giant-Size Super-Villain Team-Up (1975) #1 (includes some new material linking Marvel Super-Heroes (1967) #20 and The Sub-Mariner (1968) #20), Thor (1966) #233 (see note, directly below), Marvel Treasury Edition (1974) #13 (new framing story around The Avengers (1963) #58, Daredevil (1964) #86, Marvel Team-Up (1972) #6, Tales to Astonish (1959) #93), The Avengers (1963) #135 (in a reminder flashback, only), Captain Marvel (1968) #39 (unconfirmed), Super-Villain Team-Up (1975) #1 (unconfirmed), Fantastic Four (1961) #173 (unconfirmed). Official guides indicate Surfer moves from FF #157 directly to Thor #233, indicating that the Super-Villain framing material likely does not appear here in his chronology. They also indicate he goes from Thor directly to Tomb of Dracula #50, below. This is a standalone Silver Surfer tale by Stan Lee and Jack Kirby that makes some modifications to his story and thus is not in continuity. It has not been re-collected. Avengers (1963) #215-216: See The Avengers. Silver Surfer is the featured guest-star in this story. Avengers (1963) Annual 11: See The Avengers. 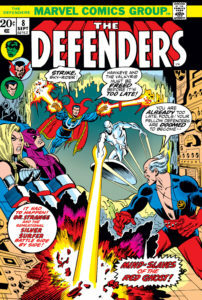 An Avengers vs. Defenders story; Silver Surfer is featured prominent. 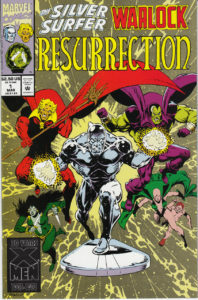 A 48-page one-shot written and illustrated by John Byrne. Also included in Essential Silver Surfer (above). Fantastic Four (1961) #259-261: See Fantastic Four. This occurs during New Defenders #125. Secret Wars II: See Marvel Universe Events. Surfer appears in #3-4 (may be cameos only) and #9, then in an epilogue in Avengers (1963) #266 (also, see The Avengers). Silver Surfer (1982) #1, Silver Surfer (1987) #1-14, Super-Villain Classics 1; material from Epic Illustrated 1#, Marvel Fanfare (1982) #51. Collects Silver Surfer (1987) #34-38, Thanos Quest #1-2 and material from Logan’s Run #6. 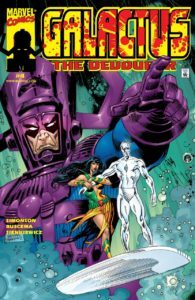 The catch-all omnibus for this massive Marvel event is primarily a Silver Surfer collection! 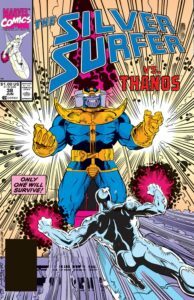 Includes Silver Surfer (1987) #34-38; 40, 44-60; Thanos Quest #1-2; Infinity Gauntlet #1-6;Doctor Strange: Sorcerer Supreme #31-36; Cloak & Dagger (1988) #18; Spider-Man (1990) #17; Incredible Hulk #383-385; Quasar #26-27; and Sleepwalker #7. Also, see Marvel Universe Events for the contents of the Infinity Gauntlet Box Set Slipcase, which duplicates these issues. Collects Silver Surfer (1987) #39-50 & Annual 3; Thanos Quest #1-2; material from Marvel Comics Presents (1988) #50. #51 is told in flashback to occur after #43, followed by Annual 3. Collects Silver Surfer (1987) #60-66, Dr. Strange: Sorcerer Supreme #36, Warlock & the Infinity Watch #1-6, and material from Silver Surfer Annual 5. Also, see Marvel Universe Events for the contents of the Infinity Gauntlet Box Set Slipcase, which duplicates these issues. #67-69: See Marvel Universe Events for collections of these issues along with Infinity Wars. Infinity War: See Marvel Universe Events. Silver Surfer is a primary character in this event! He appears in issues #2-6. Collects Warlock & The Infinity Watch #11-17, Silver Surfer/Warlock: Resurrection #1-4, Quasar #41-43; and material From Marvel Comics Presents (1988) #112, Marvel Holiday Special #2, and Marvel Swimsuit Special #2. Also, see Marvel Universe Events for the contents of the Infinity Gauntlet Box Set Slipcase, which duplicates these issues. #83-85: See Marvel Universe Events for the contents of the Infinity Gauntlet Box Set Slipcase, which collects these issues. Infinity Crusade: See Marvel Universe Events. Silver Surfer is a primary character in this event! He appears in issues #1-4 & 6. A crossover running through Thor (1966) #468-471, Silver Surfer Vol. 3 (1987) #86-88, Warlock Chronicles (1993) #6-8, and Warlock & The Infinity Watch (1992) #23-25. Silver Surfer appears in every issue. Starmasters (1995) #1-3: Not collected. A limited team-up between Silver Surfer, Beta Ray Bill, and Quasar! Annual 1997 occurs after the first four pages of #134. 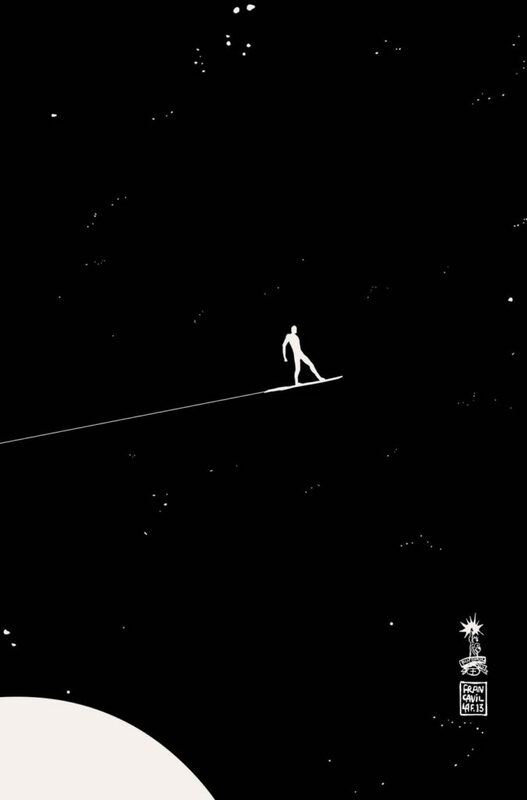 After nearly a year’s disappearance, Silver Surfer returns in Galactus: The Devourer. #7-14: Not collected. The 8-part Revelation story. Placement of these series is unclear. Due to the galaxy-altering events beginning in Annihilation, this may necessarily occur beforehand despite being released two years later. Also, Requiem may be out of continuity. Annihilation: See Marvel Universe Events. 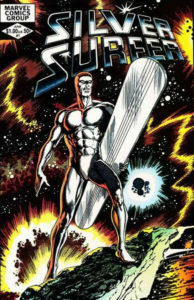 Silver Surfer appears in his own mini-series in this event as well as the main series, but his mini-series has never been collected on its own – it is inextricably a part of this event. Silver Surfer: In Thy Name (2008) #1-4 were released here, but may occur prior to Annihilation in continuity so oare listed above. This is a featured guest-star appearance for an entire arc. Also collects a Prologue issue, in which Surfer does not appear. Collects The Thanos Imperative: Ignition (2010) #1, The Thanos Imperative #1-6, and The Thanos Imperative: Devastation (2011) #1. Available in oversize hardcover. Available in oversize hardcover. Also contained in Realm of Kings Omnibus. Mighty Thor #1-6 & Annual 1: See Thor. 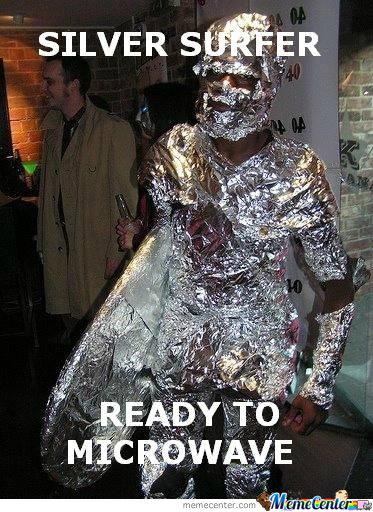 Silver Surfer is a co-star in this arc. Also includes Fear Itself: Uncanny X-Force #1-3. Available in hardcover. The Mighty Thor (2011) #8-12: See Thor. Silver Surfer co-stars in this arc. Note that this may not fit here in Silver Surfer’s continuity, as this is told across several different timespans. However, present day action fits here. Also includes material from All-New Marvel Now .1, which was also repurposed as Silver Surfer (Infinite Comics) (2014). Contains the 2016 Eisner Award winner for “Best Single Issue” – the mobius strip themed #11. This series was originally to be titled “Silver Surfer & Dawn” – it is a direct continuation from the prior series. Collects a series of Defenders one-shots (in this order) Hulk: Defenders #1, Namor: Defenders #1, Doctor Strange: Defenders #1, and Silver Surfer: Defenders #1, and Defenders #1. 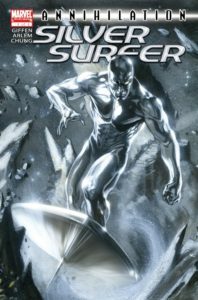 Check Amazon for Marvel’s newest Silver Surfer titles. In case you don’t already know, there’s another Marvel/DC crossover from 1995 called “Darkseid vs Galactus: The Hunger” in which the Surfer appears as a herald of Galactus, meaning it happened “before earth” (but maybe is out of continuity). Where does The Enslavers fit?